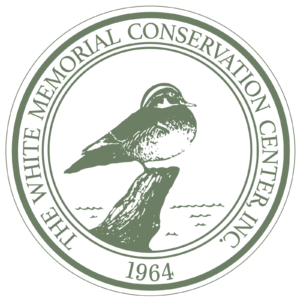 White Memorial’s weather station started recording data on January 1, 1985 to June 11, 2015 at 15 Whitehall Rd., 1.75 miles WSW of the Litchfield town green (N 41.728940°, W -73.217231°). This station was housed in a standard weather instrument shelter with was outfitted with a mercury thermometer inside and rain gauge outside. Observations were recorded daily and included daily temperature high and low, liquid precipitation accumulation, depth of snow accumulation, and presence of frost. Accumulated snow and ice measurements were converted to liquid precipitation accumulation. Starting on June 11, 2015, weather observations are recorded using a Davis® Vantage Pro 2™ with a rain gauge heater at 80 Whitehall Rd., 2.5 miles SW of Litchfield town green (N 41.723929°, W -73.212708°). Measurements are recorded every 10 minutes with a 5 minute offset on the hour. A wind anemometer installed at the highest point on the southwest corner of The White Memorial Conservation Center measures wind direction and speed. Observations include temperature, liquid precipitation accumulation, humidity, wind direction and speed. A camera has also been installed on the south side of the Conservation Center pointed in a southerly direction. Weather observation data can be viewed at the Weather Underground website hosted by The Weather Company here.